The proforma for Application will be available on the website link of www.rcueshyd.gov.in and www.onlinercues.in from 26/09/2017 to 07/10/2017(Note: 07/10/2017 is the last date for payment of fee up to 11:59 p.m.) Examination will be conducted offline on 22nd October 2017 (Sunday) from 10:30 a.m. to 12:30 p.m. (2 hours duration). The question paper will consist of 100 multiple choice questions in English and Telugu versions carrying one mark each. A common Examination will be conducted offline in 13 cities (Srikakulam, Vizianagaram, Visakhapatnam, Rajahmundry, Eluru, Vijayawada, Guntur, Ongole, Nellore, Kurnool, Anantapur, Kadapa and Tirupati) of Andhra Pradesh. 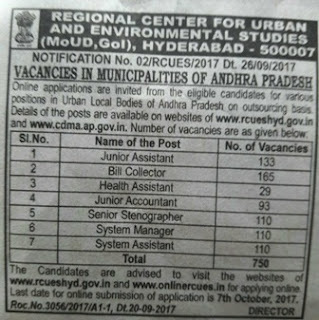 Before applying for the post, the applicant should register his/ her general details. Once applicant registers his/her particulars, a Login ID will be generated and same will be sent to his/her registered mobile number and email ID. Applicants should apply for the post using the Login ID and password. HALL TICKETS can be downloaded from 15/10/2017 onwards. Applicant can register by filling their general details and educational qualifications. While filling the same, the candidates have to ensure that there are no mistakes. The eligible applicant can select the post and proceed for online payment through Credit Card/Debit Card/Net Banking. Once the Fee Payment is done, Login details (User ID & Password) will be sent to the applicant’s registered Mobile Number and email ID. By using the User ID and Password, applicant can login and submit his/her Application form. Applicant should upload scanned copy of his/her Passport size photo and signature. Applicant needs to mention the post in order of preference. Applicant can take a print out of the application form.